A few days ago, I was writing to someone about global warming. He thought that some of my writing was on the edge; he thought they were borderline "conspiracy theories". I responded by saying that there were conspiracies involved, but more importantly there were well documented instances of a concerted effort to downplay the severity of global warming by certain interests. I was accused of the same thing in 2006, when I discussed how the rising housing prices and the high availability of mortgage loans "didn't add up". In 2008, we did find out that there indeed was a conspiracy by the banks who converted mortgages to securities, and then bet against them. 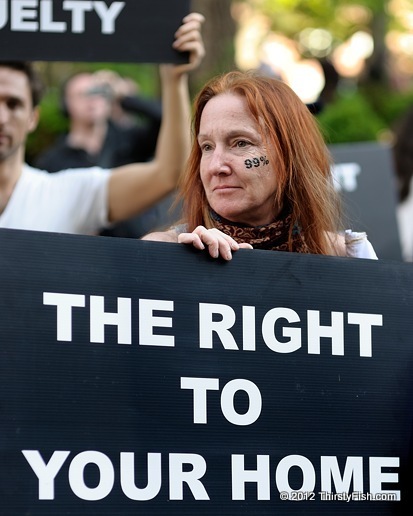 People learned the hard way that if you have a mortgage, your home is not "your" home. Since 2007, there have been over 14 million foreclosures and home repossessions. That's roughly 1 in 8 homes. But the worst is not over. 1 in 5 households still remain underwater on their mortgages, that is, they owe more than what their houses are worth. Many have called the mortgage scam, the greatest transfer of wealth in history, upwards.